Delivery & Service Optimization Made Affordably Simple! How Does Fleetzoo Work? Find Out Here. Fleeting Management & Route Optimization Software that DRIVES Serious Business Results! POWERFUL TECHNOLOGY. SIMPLE TO USE. WHAT CAN FLEETZOO DO FOR YOU? What is route optimization (also known as fleet management)? 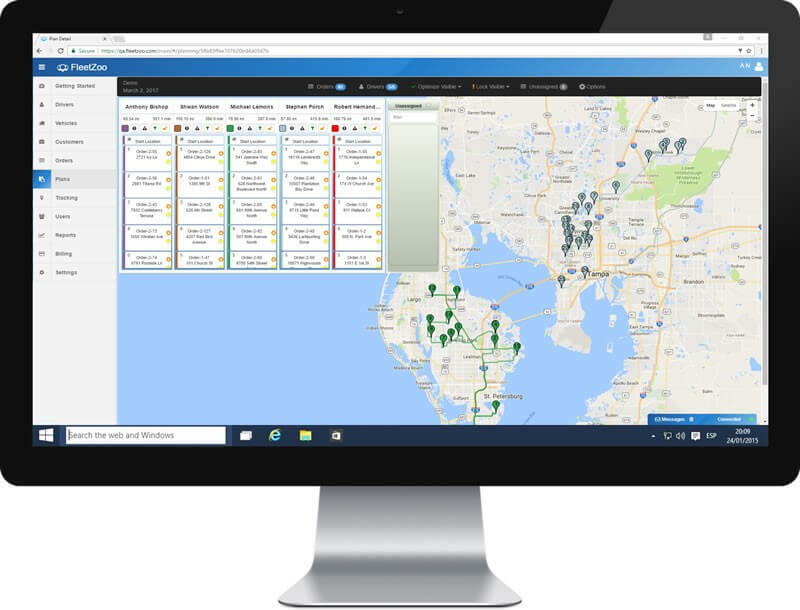 Route optimization is the process for determining the “best” assignment of orders (or appointments, or deliveries) to multiple vehicles and drivers based on many factors including location of each order and driver schedules. What is “best”? The best or optimal route is the one that yields minimum distance driven—with minimum travel time and cost—given real-world requirements like fixed appointment times. Does route optimization make sense for the size of my fleet? If you have one or two vehicles, the routing is pretty simple and a “back of the envelope” approach will work just fine. But if you have 5 vehicles and 50 orders, then there are 30,414,093,201,713,400,000,000,000,000,000,000,000,000,000,000,000,000,000,000,000,000 (yes, a three followed by 64 zeros) ways that you can do the routing. Finding the routing that is best among this many options is why you need FleetZoo. What type of businesses most commonly use fleet management software? Many different types of businesses, with one common problem: multiple vehicles and drivers combined with multiple places they need to be on any given day. What happens when we have unexpected changes to service calls or deliveries? When unexpected changes happen, with FleetZoo you can quickly reallocate new orders to your drivers in the most efficient manner. They’ll see the changes immediately on their mobile devices. Realistically, what benefits can I expect by using software to manage my routes? Depending on the number of vehicles in your fleet, and the number and distances of customer appointments, FleetZoo will give you significant savings in driver time and vehicle usage and fuel consumption. And using your resources more efficiently will allow you to add more revenue-generating appointments. Contact FleetZoo today for a free ROI analysis to see what your savings can be. How does FleetZoo pricing work? You can get full FleetZoo benefits for as little as $39/month for each vehicle. For large fleets, we will develop a custom plan that provides enterprise-level tools and back-end system integration. How long does it take to start using FleetZoo? For most fleet customers, our onboarding team will have you up and running on FleetZoo in a couple of days. What is included with FleetZoo’s 14-Day Free Trial? We will provide you with access to FleetZoo basic functions using your real vehicle, driver, and order/appointment data. This way you will be able to see the real impact that FleetZoo will have on your business. Request a free customized savings analysis today!